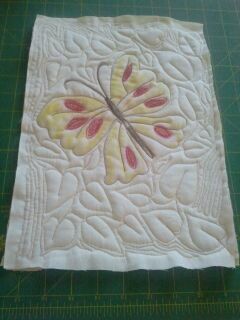 As you all know that I am participating in SewCalGal’s 2012 Free Motion Quilting (FMQ) Challenge. 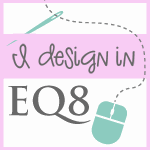 I have only just got myself organised so I thought if I am going to do this then I should give all the FMQ designs a go. After all this is all a learning experience. The January Challenge was set out by Frances Moore and I loved the way she actually went over the process of how to create a flowing leaf pattern. I gave it a go and here are my efforts. I took the pics at night so they may not be too clear but you will get the jist. In the first picture I made an all over leaf pattern to get the flow of it. I still need a lot work at evenness, but at least I was happy to get the design all over. 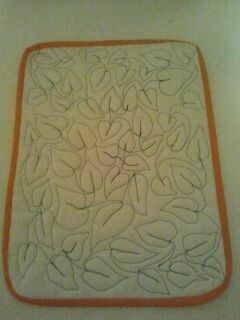 With my second picture I wanted to try to FMQ around a motif, which proved to be not too difficult but needs a lot of practice to get evenness in the shape of the leaves. Very pretty leaves, especially around the butterfly. Bravo..well done!